Locals love to keep the 19-mile beach a secret because it’s one of the few areas in the state where you don’t have to search long and hard for parking spots or fight for the perfect place to pitch your umbrella and beach chairs. There’s enough room for everyone to feel as if they have the entire area to themselves. Once settled in, you’ll enjoy the cinnamon-colored sand that sparkles with fragments of limestone crystals, and of course, the breathtaking view of the Atlantic Ocean. Keep your eyes peeled for the well-known coquina rocks found throughout the beach. The area is home to one of the largest outcroppings of these densely formed rocks full of mollusks. The other well-known areas to find these rocks are in New Zealand, so you’ll know you’re coming across something unique right here in Florida. If you’re a surfer, you’ll love this. Surfers from across the globe continue to flock to Flagler Beach thanks to its stellar waves. In fact, the area is known to host several surfing championships, so whether you’re a seasoned surfer or a first-timer, head down to check out the third best waves in the state. Looking to reel in your dinner? Visit Flagler Beach Municipal Pier, a popular hub that has its own bait and tackle shop. There, you can rent fishing equipment or buy bait to drop a line from the pier while the pelicans watch. The pier is conveniently located directly across the street from gift shops and restaurants serving delicious seafood. Don’t leave the Flagler Beaches without taking home a souvenir. Take a stroll down the popular Ocean Shore Boulevard in Flagler Beach and you’ll come across an array of locally owned boutique shops. Among the most favored by visitors are Flagler Beach Gift Shop (screen printed tees, hats, accessories and souvenirs), Bahama Mama’s Unique Tropical Gifts (beachwear, towels and coastal-inspired jewelry) and Z Wave Surf Shop (surf and skate shop with rentals). In between shopping, take a break and cool off with some ice cream at The Waffle Cone Ice Cream Shoppe, a vintage-themed ice cream parlor that also serves mouthwatering treats like milkshakes and banana splits. Each ice cream flavor is handmade with cane sugar, and you can enjoy the traditional flavors while admiring the decor of vinyl records and Lucille Ball memorabilia. Walk a few blocks north and you’ll find yourself at Flagler Beachfront Winery. Winemaker Ken Tarsitano brings in grapes from across the continent but makes the vino by the ocean. You can drop by for a tasting paired with tapas while enjoying the view of the ocean from the patio. The winery’s signature wine slushie is a perfect way to end the night. Check out the local farmers market every Friday and Saturday in downtown Flagler Beach. You’ll have the chance to browse through local and homemade goods like citrus, honey, soaps and more. The market is open all year, rain or shine, and runs from sunrise to early afternoon. Did you know that the area is ranked as one of the most dog-friendly beaches in Florida? Flagler Beach is proud to have a designated strip of land (north of N. 10th street and south of S. 10th Street) reserved for dogs and their owners. Here, your furry pals can frolic in the ocean as long as they remain leashed. Another permitted area for your pup is Varn Park, north of Flagler Beach. This 8-acre park is a secluded, beachside oasis with towering trees and an observation deck. Plus, fishing is permitted at the park, so there’s something fun for both you and your pet. Because of the quiet location, it’s also a popular spot for birding. Parking is free, and you can take advantage of its on-site restrooms and outdoor showers. Click here to check out Ziggy&apos;s Flagler Dogcation! Get your nature and wildlife fix at Gamble Rogers Memorial State Recreation Area, where you’ll likely see right whales submerging in and out of the water off the coast. Between December and March, the whales migrate to the warmer waters of the Florida coast, creating a natural marvel for visitors from the land. It’s common to spot wild dolphins when you trek or walk along the trail at Palm Coast’s Waterfront Park. However, if you wish for a more up close and personal encounter with the friendly Atlantic bottlenose dolphins, visit Marineland Dolphin Adventure. You will get to swim alongside the dolphins while getting important lessons about the biodiversity of the animals. Marineland Dolphin Adventure welcomes families of all ages. Make your visit a smooth and grand experience by researching some of the fabulous accommodations suited for your budget. The area has everything from luxury resorts to private beach rentals to affordable beachside motels. Or go rustic and stay at beachfront campsites where you can pitch your tent or park your RV. 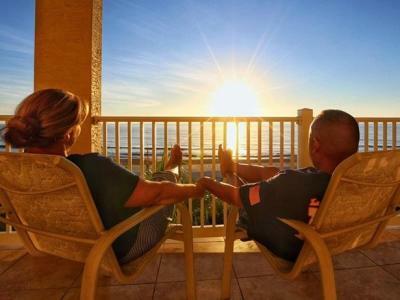 Anyone that’s familiar with the Palm Coast area will tell you that A1A Scenic Highway is the best way to get the scope of the land, so plan on taking that route to get to your destination. This iconic interstate runs parallel to the ocean and takes you through the stunning views of the Intracoastal Waterway and protected nature reserves. Keep in mind, the surrounding nature areas are strict about not having high rises, meaning your view won’t be obstructed and you can admire the stunning beauty that is Palm Coast and the Flagler Beaches.